This crepe paper is flame-resistant, and of superior quality. It's the most popular crepe paper for a wide variety of decorating and craft uses. 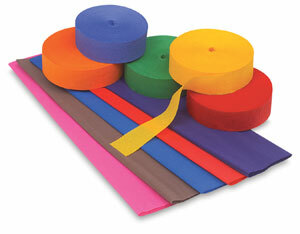 Streamers — 1-7/8" wide × 500 ft long rolls. Folds — 20" wide × 7-1/2 ft long.